This exhibition is part of ATA’s Laffer Curatorial Program, funded by a generous donation from Christine Laffer. 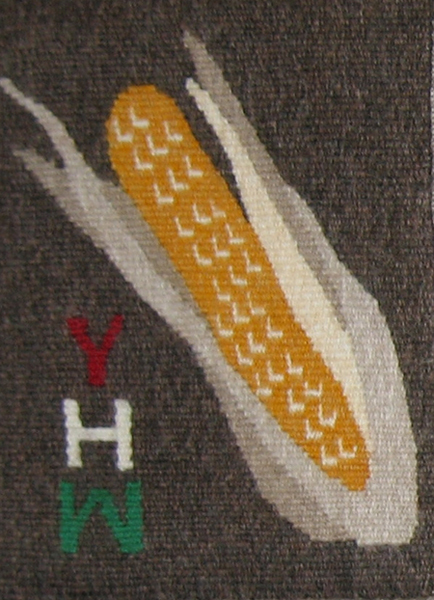 “Cape,” c. 1972, Rya wall hanging, wool, 130 cm x 58 cm. ANU Art Collection, Photographer: David Boon. The earliest work in this exhibition. As Belinda Ransom was born, and grew up in New Zealand, this could refer to the capes that were made from feathers and worn by the Maori for ceremonial purposes. A strong thread binds Australia to the traditional tapestry weaving of William Morris, through Scotland and the work of Belinda Ramson. Belinda Ramson, (born Wellington, New Zealand 1935, died Tanja, New South Wales November 2014) first learned cloth weaving in 1965-66 in Canberra, Australia, studying with Solvig Baas Becking. Although Baas Becking worked in tapestry herself, she did not teach the technique. Ramson was dissatisfied with cloth weaving and was seeking something more fulfilling. 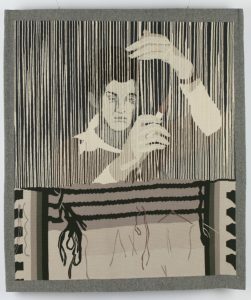 “Self portrait,” 1980, wool, cotton, high warp tapestry, 130.0 x 110.0 cm. Acc. 1981/00T1. Purchased 1981. Collection: State Art Collection, Art Gallery of Western Australia Photographer: Bo Wong. An enigmatic and evocative work that shows the weaver at work, facing the loom with loose threads not yet sewn in. The thick warps allow the image of the weaver to be seen. 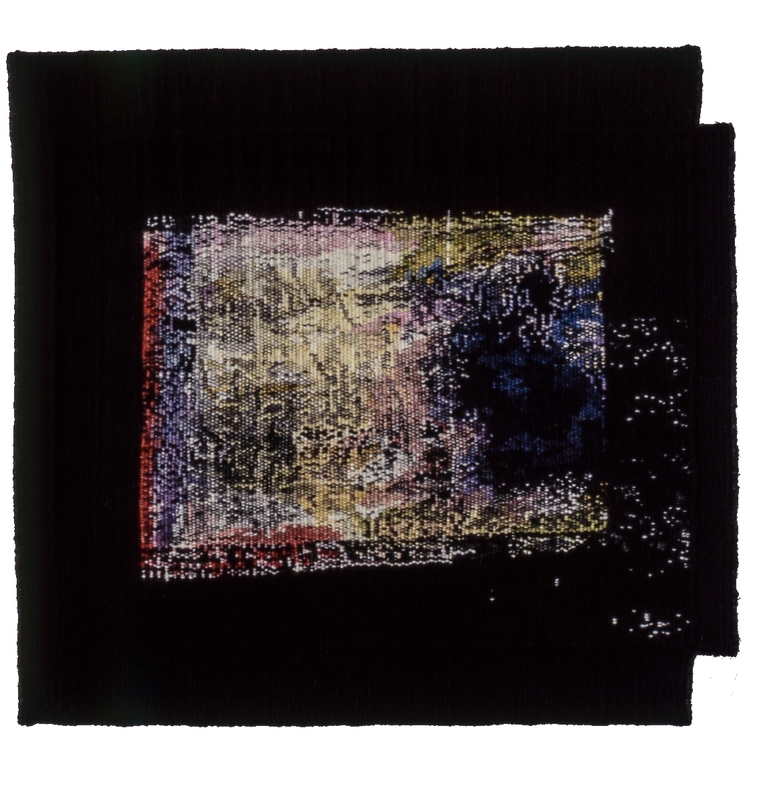 “Tapestry: Rug on floor,” 1981, wool (tapestry), 43.5 x 60.3cm. Acc. 4:0575. Purchased 1981 with the assistance of the Crafts Board of the Australia Council. Collection: Queensland Art Gallery. © QAGOMA. Photographer: Natasha Harth, QAGOMA. 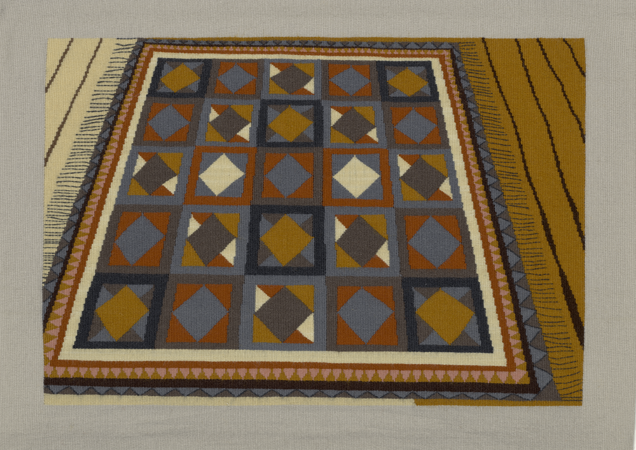 Diamonds, checks and diagonals in “Rug on floor” add an illusory element, while also speaking about weaving. Ramson’s teaching and training reflected these principles, and from its beginning the Victorian Tapestry Workshop (VTW) reflected a contemporary art and design aesthetic, while offering a professional model of exemplary weaving knowledge, skills and technologies. Renamed the Australian Tapestry Workshop in 2010, its record of innovative, collaborative working relationships between weavers and artists includes the completion of more than 500 tapestries. 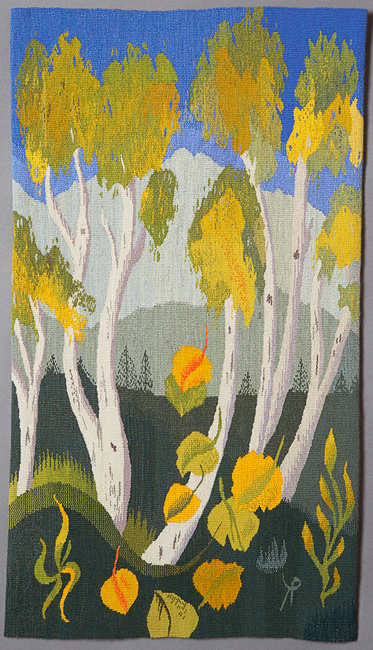 (Cochrane) Weavers work with artists to translate an artwork into tapestry and to develop an interpretation that best expresses the artist’s intention, while taking advantage of the unique qualities of the medium. Both artists and weavers contribute to the process. “Medieval to Modern” (series). 2003. [Medieval detail from “The Lady with the Unicorn” Tapestries, France, Late 15th Century]. wool, cotton. 20 cm x 22 cm. Collection of Meredith Hinchliffe. Photographer: Valerie Kirk. Cresside Collette, one of the first artists to be trained at the VTW, told me that Belinda Ramson gave 15 young art-school trained artists classes in tapestry weaving. Over a two-month period, Ramson travelled from Canberra to Melbourne to give intensive classes every second weekend for two months. They were taught techniques and in the intervening period, were set tasks and targets incorporating what they had learned. At the end of this period, five young women were selected to become the first weavers at VTW. 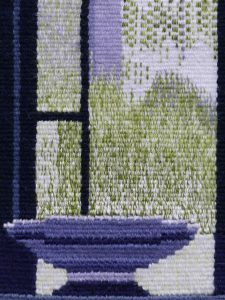 “The Sitting Room Window,” 2013, wool, cotton, 38.5 x 19.5 cm, Private Collection Photographers: Ian Williams and Helen Mariampolski. 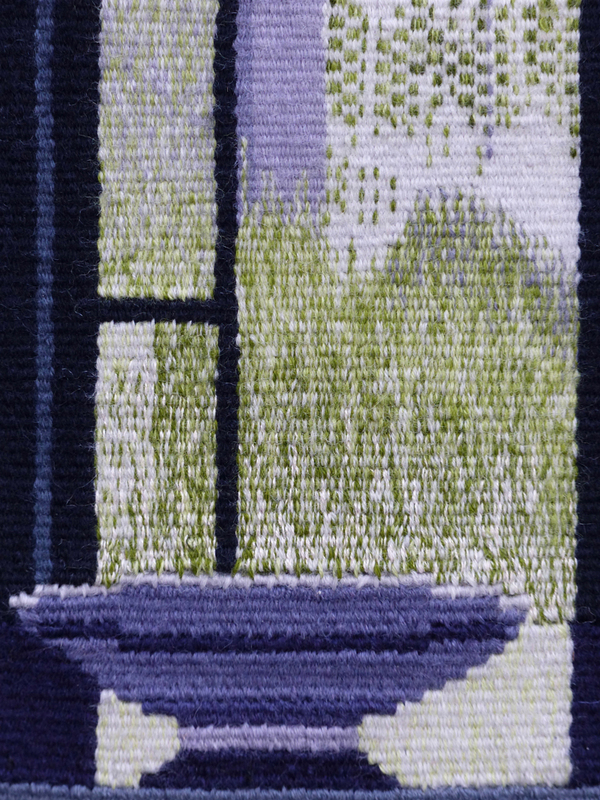 “The Sitting Room Window,” 2013, wool, cotton, detail, Private Collection Photographers: Ian Williams and Helen Mariampolski. Ramson followed the processes that Archie Brennan used: drawing, sometimes painting and sometimes photographing for her inspiration and design development. She drew a cartoon which was brought up and inked on the warp before weaving tests. In the ABC interview she said that this was when she experimented – with the design and the colours – tested, and made changes and alterations as necessary. 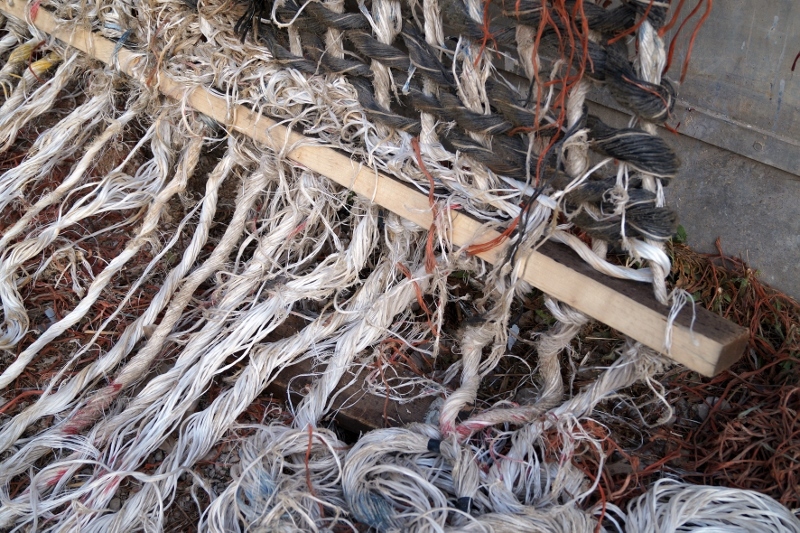 She used a cotton twine as warp and generally fine wool for the weft. 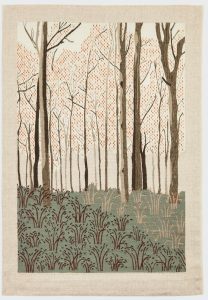 When discussing a work with trees and water, she explained that she used wool for the trees as it absorbs the light, but used cotton and linen for the water, for their reflective qualities. Materials were selected to give her the result she was looking for. 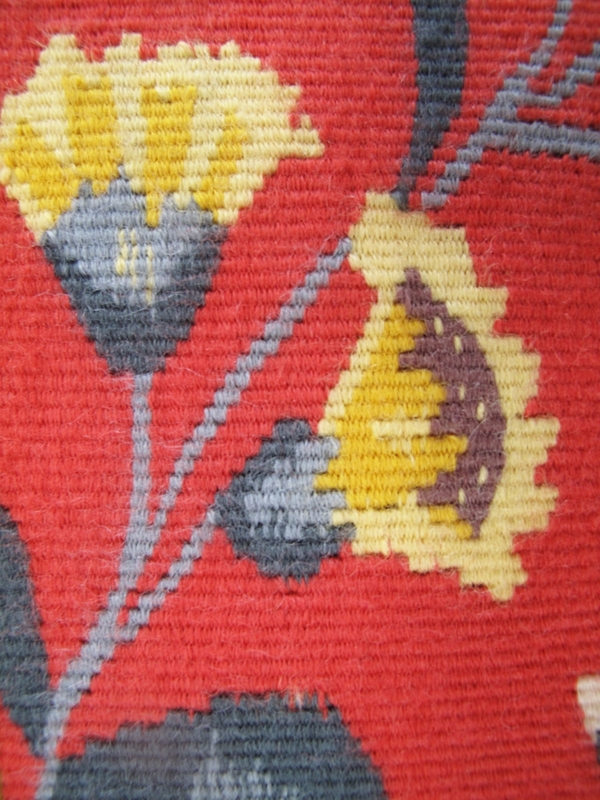 Belinda rarely blended her colours on the bobbin, preferring to use the hachure technique to achieve tones and colours in a more precise and graphic way. 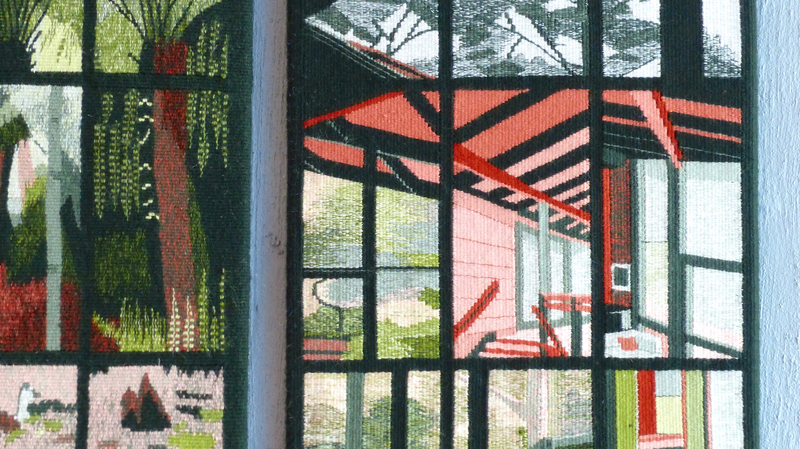 In general Belinda Ramson’s tapestries reflected her immediate surroundings, both the intimate and domestic, and the environment where she lived. Many works depicted her home, views looking through a window or door to the garden beyond. Others illustrate the environment in which she lived for the last thirty years or so of her life, in the bush near the ocean, on the far south coast of NSW. She depicted the rocks, sea, sand and flora in a tonal palette that expressed the delicacy and drama of the area, and the mirroring and reflective elements in the locale with the changing play of light on the land and sea. This region meant a great deal to her, and she captured its numinous qualities. After her work with the VTW, Belinda always worked as an independent weaver. 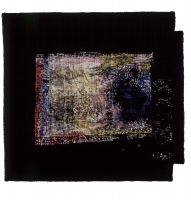 Her own body of work in drawing, painting and woven tapestry has made a significant contribution to tapestry in Australia. Leading by example she demonstrated how a dedicated weaver could master the required technical skills and combine them with a strong visual sensibility to produce a major body of work. She exhibited regularly in group exhibitions in Australia and her work has been collected by several museums. In a major commissioned work titled “Woden Valley” she divided the work into three horizontal sections, the top depicting the land as it would have been prior to white settlement, four buildings each representing a period of white settlement in the centre, and a wide image of the valley as it was when the work was made, at the bottom. “Woden Valley,” 1984, woven tapestry, 4.7 m x 1.15 m, commissioned 1983, ACT Government. Photographer: Brenton McGeachie. Ramson was commissioned to weave “Woden Valley,” for a newly-built public library in Woden Valley, Canberra. The large work uses architectural images to depict the growth of the valley, and white settlement from the early 19th century. From left to right, the settlers’ hut is made from logs cut down from the land and using wattle and daub. The horizontal lines on the right-hand side are a water tank of corrugated iron. The second building is an enormous wool shed which still stands in the valley. Thousands of sheep would have been shorn here over the many years in which sheep grazed in the valley. The next building represented the squattocracy and the wealthy people who settled in the valley, imposing their English architecture to an alien land. The building is now used as the home of the Governor-General. The building on the far right was built as a technical and further education college and is a lively building that contrasts with the tall, block office buildings which were built in the town centre. 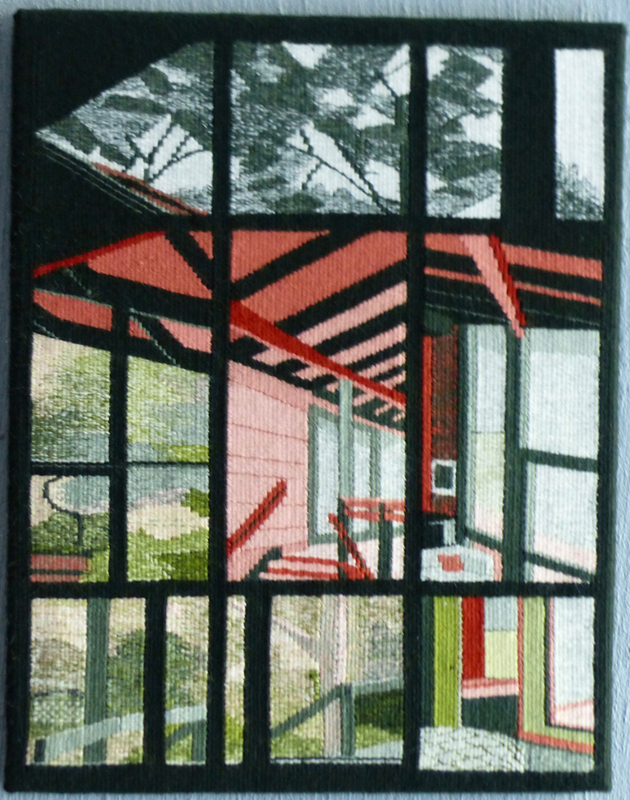 This work further reflects Belinda’s interest in architecture and the lines buildings create. 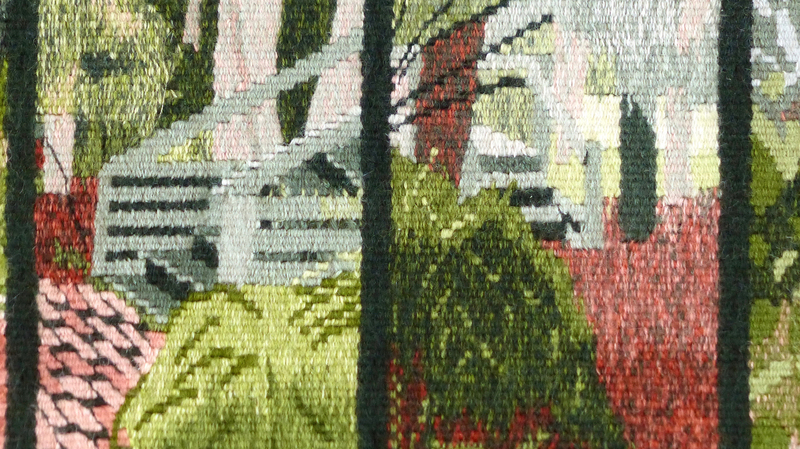 The top section of the tapestry illustrates the valley plains as grazing land and the bottom panel shows the valley as it was in 1982. These two sections are panoramic views, telling of the vastness and natural qualities of the Australian landscape. 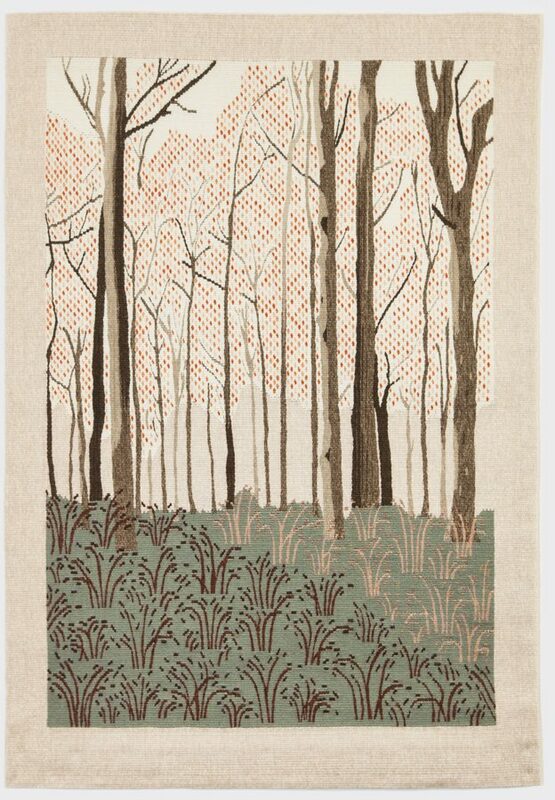 This work took ten months of weaving, after two full months of research.When creating illustrative works, such as “Glimpses of Tanja” and “Early Morning Bithry Inlet,” she began working in a precise grid, as though the small images were photographs, placed on a horizontal surface. Sometimes, an image is divided by a vertical line and sometimes the images are quite different. 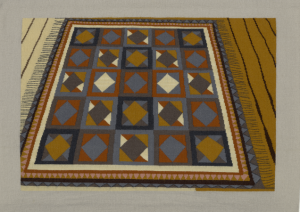 She explained to a private collector that the grid worked horizontally in the way of traditional tapestry weaving, allowing the eye to follow movement left to right. Belinda explained that some compositions demand vertical execution, for example a house on a hill, and others demand horizontal expressions such as a low building on flat land. Glimpses of Ferncroft Avenue,” 2007, (triptych) wool, cotton, (l) 43.5 cm x 35.0 cm, (c) 110.0 cm x 44.0 cm, (r) 44.0 cm x 35.0 cm. Private Collection. Photographers: Ian Williams and Helen Mariampolski. 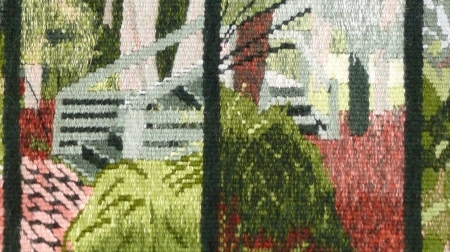 "Glimpses of Ferncroft Avenue," 2007, (triptych) wool, cotton, detail, Private Collection. 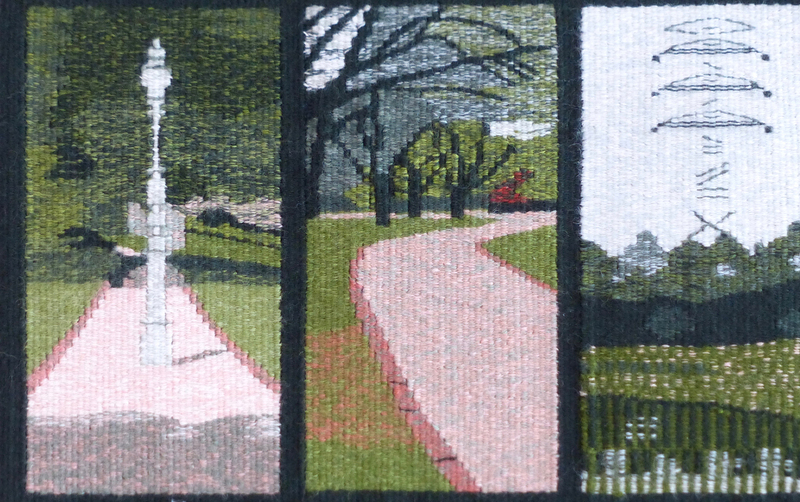 "Glimpses of Ferncroft Avenue," 2007, (triptych) wool, cotton, detail, Private Collection. Photographers: Ian Williams and Helen Mariampolski. "Glimpses of Ferncroft Avenue," 2007, (triptych) wool, cotton, left panel, Private Collection. 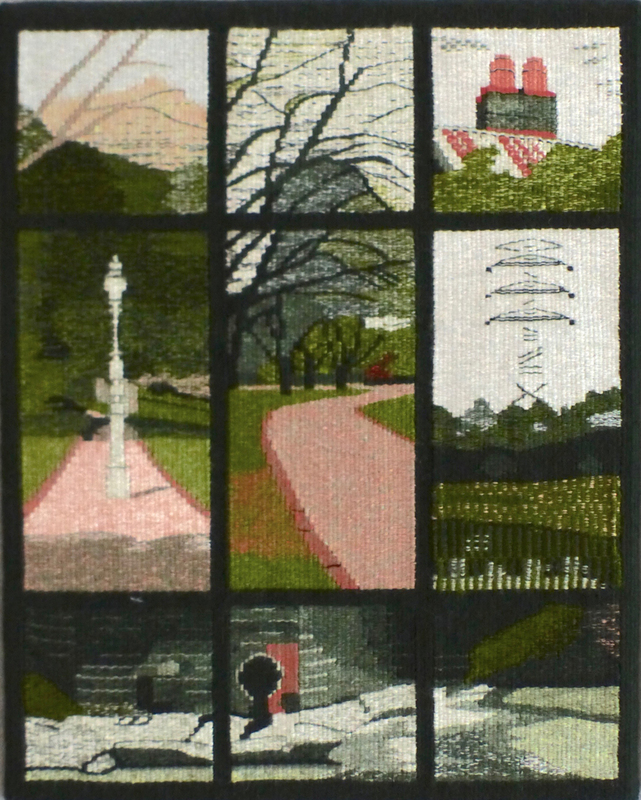 "Glimpses of Ferncroft Avenue," 2007, (triptych) wool, cotton, right panel, Private Collection. Photographers: Ian Williams and Helen Mariampolski. 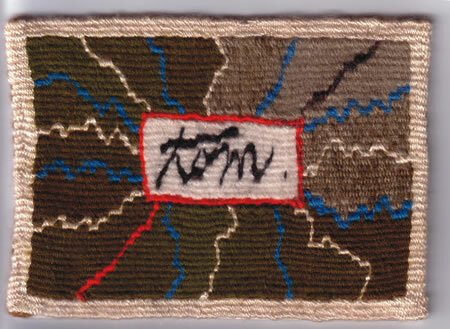 In her obituary for the ATW newsletter, Kay Lawrence said: “Through her work as artist, teacher and consultant to the ATW, Belinda Ramson played a crucial role in shaping the vibrant and distinctive woven tapestry movement that emerged so surprisingly and with such authority in Australia in the 1970s. Her influence is threaded through the development of contemporary tapestry in Australia: an art form now renowned internationally for its transformative and expressive use of an ancient medium. Belinda Ramson’s legacy is the vibrant and creative tapestry field in Australia, with its attention to technical excellence, relationship with contemporary art and strength of visual qualities. Meredith Hinchliffe is an independent curator, writer and arts advocate living and working in Canberra. She thanks Valerie Kirk for her help in creating this show of Belinda Ransom’s work. ABC Radio Interview with Jen Hunt, November 26, 2009. Australian Weavers in Wool, 1980. Brennan, Archie, email, May 2017. 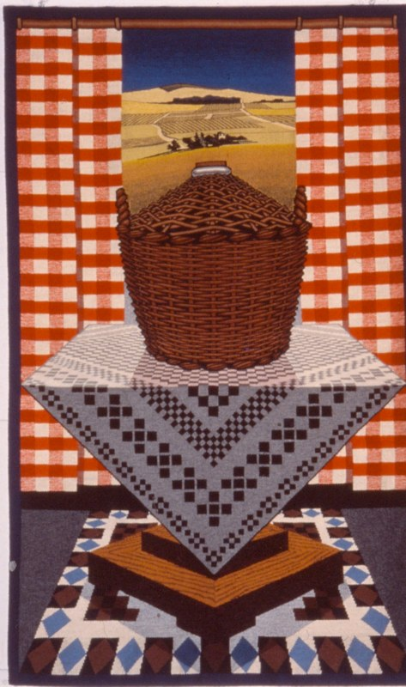 Camm, Anthony, Catalogue essay for About Time Australian Studio Tapestry 1975 – 2005, Ararat Regional Art Gallery, Ararat, Victoria, 2010. Canberra Spinners and Weavers, Newsletter, Canberra, ACT, 1969. Cochrane AM, Grace, et al. 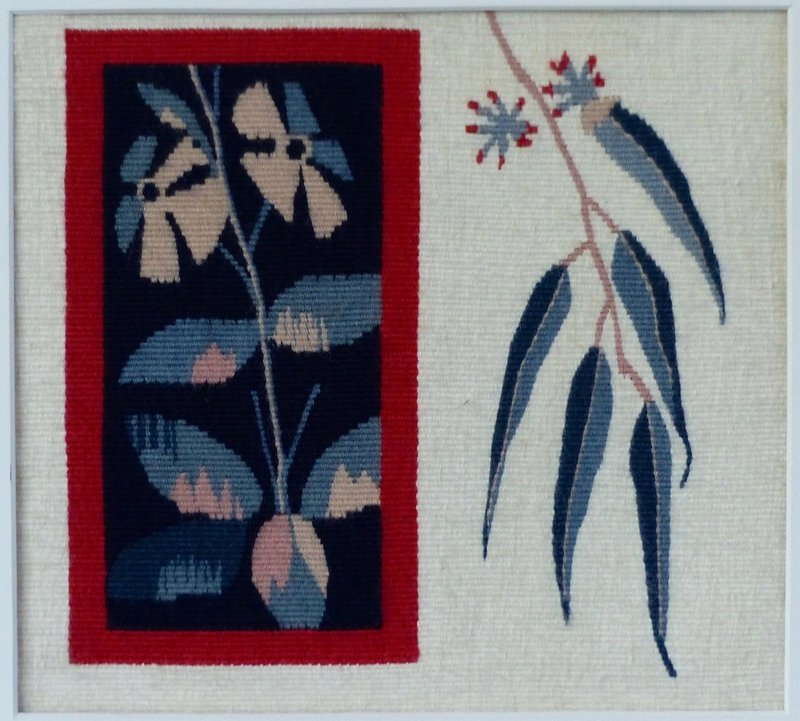 Many Hands: The First 40 Years of The Australian Tapestry Workshop. HarperCollins Publishers, 2016, Sydney, Australia. Derum, Kate, Ed, International Tapestry Yearbook 2004, Victorian Tapestry Workshop, Melbourne, Australia. Kirk, Valerie, Scottish Tapestry Tradition, Technique, Narrative, and Innovation: Its Influence on Australian Woven Tapestry 1976-1996, Master of Arts (Honours) Thesis, 1999, University of Wollongong, NSW, Australia. 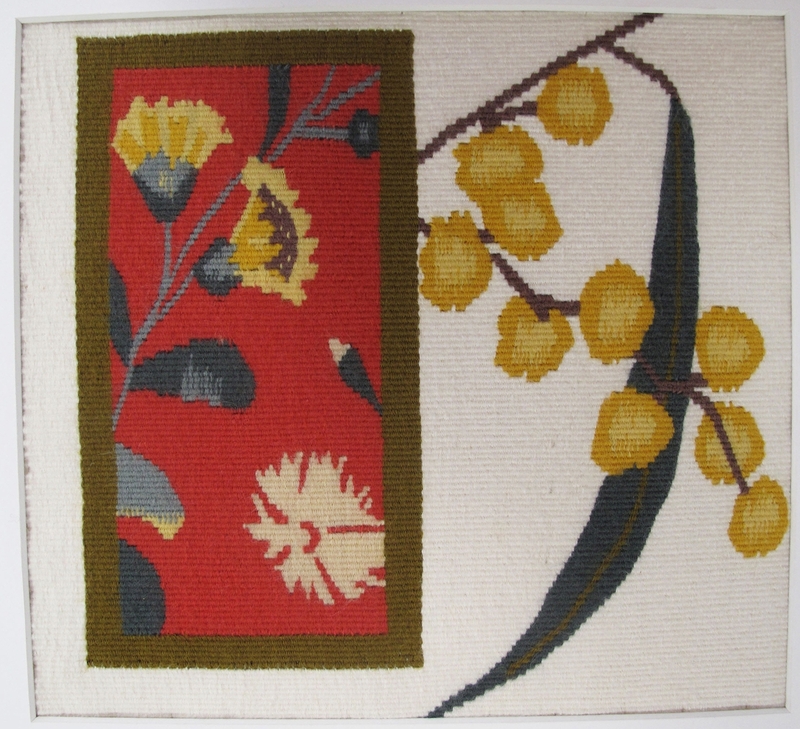 Lawrence, Kay in Australian Tapestry Workshop Newsletter, Melbourne, Victoria, November 2014. Private Collector, Conversation, May 2017. Ramson, Belinda, “The Year at the Dovecot”, Craft Australia, Australia, Crafts Council of Australia, September 1974. Ramson, Belinda, Woven Tapestry Demonstration, video recording, Canberra Instructional Resources Unit for the Department of Prehistory and Anthropology n.d.
Wood Conroy, Diana, Catalogue essay for Texts from the Edge: tapestry and identity in Australia, 1995, Jam Factory Craft & Design Centre, Adelaide, South Australia.